The result was more than I hoped for. The beef crisped up like a dream and the sauce was tangy and luxurious, my husband almost licked the bowl after he finished!! Don’t be put off by the length of the ingredients list here. Most of them are store cupboard essentials and this really is an easy recipe to make. Two important things before you get started – firstly, to get the beef to crisp up you need the pan very hot so it’s best to fry the beef in batches (see the method for more detail on this). Secondly, to make the cooking process really straightforward, it’s best to have everything chopped and mixed before you start. You want to mix the sauce, coat the beef in the flour and spice, have the veggies chopped and have two plates ready and out on the side before you get a pan out the cupboard. That means cooking and assembling the dish will be nice and speedy. I hope you enjoy this one as much as we did!! Edit: This recipe was originally scheduled to be posted next weekend but after posting a sneak peak on my Facebook and Instagram pages, I have been inundated with lots of you wanting the recipe for this weekend so, your wish is my command and I have brought the publication forward by a week. Do let me know what you think!! Begin by making the stir fry sauce. Pop all the ingredients into a mixing jug, give a good stir and then pop to one side. Easy! Next pop a couple of pieces of kitchen roll onto a plate, pop the beef onto the kitchen roll and dab away any of the excess water from the surface of the beef. Then pop the beef into a large bowl, add the cornflour and 5 spice and mix everything together until the beef is well coated. If you are having rice with this, pop it on now. Then, take a large wok, heat to high and add ¼ tsp of the seasame oil. Once hot add about a third of the beef in one layer and fry for a few minutes until you see one side starting to go nice and crispy. Turn the beef and let it crisp up on all sides then remove from the pan, popping on a plate to one side. Repeat this until you have cooked all the beef. Note – You don’t want to cook the beef all at the same time as you want the pan to stay nice and hot to give you the crispy finish. If you overload the pan the temperature of the pan will drop so you won’t get the effect you are after. Once all the beef is cooked and on a plate, add the final ¼ tsp of sesame oil to the now empty pan/wok and add the onion, peppers and chilli (if you are having it). Fry for 5-6 minutes until the onions have gone nice and soft and translucent. Remove the onions, peppers and chilli from the pan, popping to one side on another plate. Finally, add the stir fry sauce to the pan, simmer for a couple of minutes to allow it to reduce and thicken a little and then add all of the beef back to the pan, coating well in the sauce. Once coated add the cooked onions, peppers and chillis to the pan. Add ¼ tsp ground ginger and the juice of 1 lime, toss everything together and then, once everything is coated nicely in the sauce and piping hot, remove from the heat. Add the rice to a bowl, top with the crispy chilli beef and finish with a sprinkle of spring onions. Serve with a small slice of lime per person. Would this work using chicken instead of beef? I can’t see why not Lesley, just make sure the chicken is cooked through before you take it out the pan! would the smartpoints stay the same do you know? My favourite dish though usually have chicken from takeaway. Please can you email this to me. Not up to it at the moment as been ill but will look forward to trying it out when recovered. In the ingredients list, it says tbsp of oil – but in the method it says tsp…not sure which one it is? Thanks! Good point, Joanna! If you use 1/4 of a teaspoon 4 times, that’s a total of 1 teaspoon. The recipe calls for 1 tablespoon. Are you meant to use 1/4 tablespoon per for each batch of beef, or 1/4 teaspoon? Sounds marvelous… cannot wait to try! I can not wait to have this for tea tomorrow, will I find sriracha in any supermarket? It isn’t something I have heard of. It’s a chilli sauce Helen and they have it in most supermarkets, it has a green lid. It’s pronounced siratcha 🙂 hope you like it!!! I think Sweet Freedom would be fine too 🙂 hope you like it! Just made it! Absolutely delicious, a little spicy may leave out the chilli next time (there will definitely be a next time!). Thank you for everything you do, we love all your recipes. Bought Sriracha from Sainsbury’s in the ketchup and sauces section. Wow just made this and it was lush! It is hot but I like hot! Made this last night and it was lovely but hot. Will need to turn the chilli down next time I make it because there will definitely be a next time. made this tonight, absolutely loved it! was indeed pretty hot but i like that. Don’t think I quite managed to make it crispy enough… not sure why. pan was super hot (set off smoke alarm multiple times!!) wonder if i didn’t cut beef small enough into strips. anyway will 100% be making again – loved it! Just started weight watchers in the past month after getting engaged and so far mainly just using your recipes – they are all fab and really tasty – hardly feels like a diet! thats for all your help. 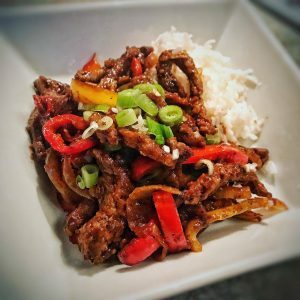 What kind of beef do you use in this recipe? Any chance you could reply with a link to the kind of beef used? Tried this tonight and absolutely loved it! Thanks so much for your recipes they are full of so much flavour and are so tasty I don’t feel like I’m on a diet at all, you’ve made my weightwatchers journey so much easier I love cooking now too! This was delicious a big hit with all the family definitely making this a favourite . Seriously amazing! Thank you so much. Boyfriend also really enjoyed it and still argues with me that it can’t be a healthy alternative as it tastes better than the take away version! Tried this for lunch today and was delicious! Is it the cornflower and high heat that makes it crispy? I had to add more oil to stop it burning but was still delicious. Thanks! I made this last night ….wow….delicious! Hubby even raved about it ! Another of your recipes added to my regular list! Made this the other night Delicious!!! Definitely make this again. I made this last night and loved it. I did however use 1 cal spray and then added the sesame oil at the end as it has a low burning point. This is delicious. I left out the chilli though. As although kids like a little spice think adding a chilli would have took it to far. We ‘ll loved it, even my 4 year old! 👍 scrumptious, another SKS meal gone down well in my house!